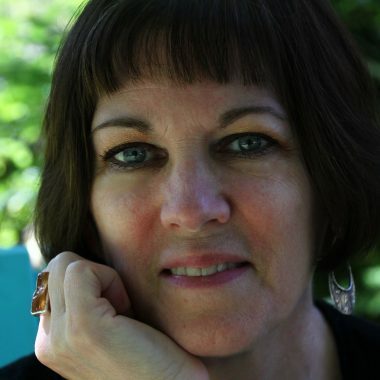 Jane O'Reilly lives in Minneapolis and has an MFA in Writing for Children and Young Adults from Hamline University. She writes beautifully voiced and thoughtful MG fiction. Jane O’Reilly’s debut novel, THE SECRET OF GOLDENROD, published with Lerner to fabulous reviews. Her second novel publishes in 2017. In addition to her MFA, she also a McKnight Fellowship in Screenwriting. She lives in Minneapolis with her husband, dog and cat in a hundred-year-old house with squeaky floors and radiators that clang in the night. Coming from a long line of storytellers, I can’t remember a time when I didn’t want to be a writer. As a child, I kept a journal, wrote poems and followed my mother around while she cleaned the house, reading to her my latest work. With the exception of college papers, however, I didn’t take my writing seriously until my own children were in middle school. At that time, I dabbled in essays about raising kids and taking family vacations. Then one day I had an idea for a screenplay about an estranged family in which I exaggerated my siblings’ traits to create the characters. I was instantly launched as a fiction writer. A variety of classes and workshops led me to children’s literature, which is where I found my truest heart. I love all stories, including—and maybe especially—the ones told at the family dinner table. My mother read to me CHARLOTTE’S WEB, STUART LITTLE and MARY POPPINS, among other classics, and I loved them all. But I’m not sure what mattered most, the story or that my mother read to me. I named my first kitten Fern and was constantly making tiny furniture and miniature accessories out of tossed items, so clearly E. B. White made a strong impression. But there are two other books I read on my own which left indelible memories: MY SIDE OF THE MOUNTAIN and MRS. MIKE, both of which carry themes of the importance of home and family, strong themes that appear in my own work. Can you talk us through the writing of your fist book? What were the key moments? There is a difference between the first book I wrote as a serious writer, EVERY KIND OF BLUE, and my first published book I began writing at least ten years later, THE SECRET OF GOLDENROD. Coincidentally, they both have a doll, but it is no coincidence that the themes in each one are family, home and truth. GOLDENROD, which is also the name of the house in the story, went through a series of drafts just to arrive at the right point of view. I knew the house was a character from the get-go, but I took my own idea too literally and began by alternating perspectives between the house and the main character, Trina. That didn’t last long because the house quickly ran out of things to say. A key moment while writing THE SECRET OF GOLDENROD occurred when I realized I was writing a fairy tale within a fairytale, but that my story was grounded in reality, which made third person narration a natural fit. It wasn’t easy to land an agent until I put my heart and mind to work at the same time. I had been submitting work for fifteen years, agented and unagented, to no avail. When I finished THE SECRET OF GOLDENROD, I was pretty sure I had a story worthy of publication. Coupling that gut feeling with growing older, I decided the time was now or never, so I made finding an agent another part-time job. I ramped up my query letter by going out on a limb both emotionally and creatively, for me anyway, and spent three full days a week researching agents, customizing my letters and sending them out. Within three weeks I had three agents interested in representing the book and me. I chose Sarah Davies because of her enthusiasm. I knew she would champion the book, and me, which she did. And then some. My writing days are not consistent because my life is not consistent. I was taught I had to write every day to be a true writer, but had I believed that, THE SECRET OF GOLDENROD wouldn’t be on bookshelves today. I wish I had the luxury to write every day, and sometimes when I feel sorry for myself I think, “If only…” but instead I have learned to take my writing seriously and happily and write when I can—and be honest about when I can’t and tell myself that it’s still okay. I have also learned that I can’t write all day anyway, so it is possible to have a job and be a writer too. My writing has spanned several houses and many locations—from basements to porches. I wrote THE SECRET OF GOLDENROD in my office in my 100-year-old house looking out on my garden, which includes a huge patch of raspberries that suddenly sprouted a single sunflower. I took it as a sign of something golden to come. My inspiration comes from things I know and love. People, primarily. And, admittedly, houses. My stories come from relationships I have had or know about, handed down stories, secrets finally told, my memories, other people’s memories, observations and everything in between, which means every bit of fiction I write contains an amazing number of truths. I struggle recalling names and dates, but the feelings always stay with me. Besides, as a fiction writer, I can always make up the names and the dates. I am a terrible quoter, which is probably good because quotes are rarely useable in fiction, but luckily I have a good ear for dialogue. If you have a dream to be a published author, my advice is to never give up. And don’t wait until everything is perfect to share your work because you will never achieve perfection. Just make it really, really good. If you write from your heart you will tell a good story. Allow people you trust to give you constructive feedback. Join a writing group. Be willing to revise. And then revise again. Can you describe three aspects of writing craft that have been most important as you’ve developed as an author. Learning how and why to revise has helped me develop as an author. I used to think that if I had to craft a story, that if the words and images and feelings weren’t there from the start, then I was cheating by adding them in later. But the truth is, revision comes from the same place as the original story—the desire to tell a story and have it be understood by the reader. The story needs to make sense even if the world your character is trying to figure out does not. The process of revision, the actual crafting of your work, does justice to your story and its characters by allowing such things as details, character arcs, emotions and themes—key elements of craft— to not only surface, but land where they belong. I am lucky. Minneapolis is a great city for the arts and I know a lot of authors in the area and get to dine with them often. But I would love to have a quiet dinner with Markus Zusak and Lois Lowry who wrote my two most-favorite books, THE BOOK THIEF and THE GIVER, respectively. Which fictional character do you wish you had invented? That’s a very interesting question because it makes me realize I don’t love my most-favorite books for their characters, but more for how their stories are told, the voice, and the story itself that is told. I think of myself as a realistic fiction reader and writer, but I sure wish I had thought of the fantastic character named Skellig.